The Tradfri smart plugs are unusual in their design as they are physically large, but can be mounted so they do not block off another socket to the side or above with the rest of the casing. 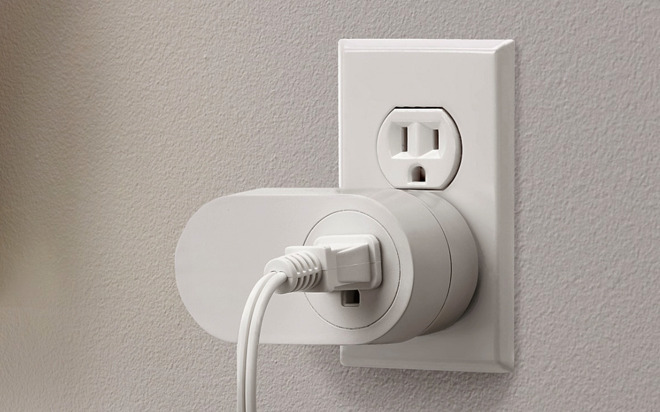 I’ve seen outlet strips in Europe that have all the outlets at a 45º angle so you can plug in either a vertical or horizontal wall-wart without blocking anything. I never understood why manufacturers insist on designing AC adapters that are guaranteed to block outlets - there are some that will even block outlets both above and next to the one being used. I have to make a correction here - it’s not ‘Tradfri,’ it’s ‘Trådfri.’ Å is a distinct letter from A in Swedish, and ‘Trådfri’ means wireless. I can see with my own eyes that they are so big that they would physically block a second one in the neighboring outlet. There are lots of power cables I own that would be blocked by this device. And each of those cables claims to be small enough to claim that it doesn't block anything in the neighboring outlet. I don't understand why these things are always such massive bricks. Why not make them inline cords so that you can easily plug them into any outlet? What's the worst that can happen—you get an extra 6–12 inches of cord? These smart outlets have their uses but when it comes to controlling lights the Phillips Hue system is the best. Light out. Do you have to use Ikea's hub for these to work? I've already got hubs from Philips and Nanoleaf and I'd prefer to not add another. At the very least, Ikea's hub is required. I'm not sure if there are other compatible ones, though. Thanks to zigbee it should just work; but… it’s not launched as a generic plug, so ymmv. Just google it and you’ll find people posting about their results. Good to know. Thx. I'm intrigued as I like mood lighting. I'm especially interested in having it behind my TV.